30" diameter - I'm guessing the name for this doily comes from it being so large it covers most tables, so it is only on the table BETWEEN MEALS, and taken off for actual eating! I'm thinking my table is actually something like 26-28"!!! 3 balls of 350 yd size 10 thread, and I've heard some people needed a 4th ball! Old time Crochet Magazine from 1997, Vol 19, No 19, Pg 23-27. 1. In round 39 a dc group consists of 13 dc, and yes the pattern is correct in telling you to slip stitch in the first 6 dc. 2. You will have 82sc and 82 ch-8 loops on round 39.
. Q: round 45. The pattern says to dc in each ch and sc around. I’m afraid I know the answer to this question, but I’ll ask anyway. Do I really dc in each chain or is it 8 dc in the 8-ch loop? I think I may need to go back and redo Round 44 to make the chains looser and easier to crochet into. A: yes you really dc in each chain. On round 45 after doing a dc in each ch and sc I had 738 dc, 185 V-stitches. 5. Rnd 46 I have 145 V stitches, Also make sure you start right by dc in base of the first ch-5. > stitch. Ex: ch-3 at beginning is counted as dc. Rnd 38: "Ch 3, dc in ea dc and ch around. (I think she meant to say; dc in ea dc and ch sp around. But I could be wrong! What I did was a little different. I did dc in ea dc but instead of dc in ea ch, I just did one dc in the ch space ( the ch space is made up of a ch 2 from the previous round) If you do a dc in each of the two chains it doesn't work out right for rnd 39. Rnd 39: sl in next 6 dc's, ch 1, sc in same place. *ch 8, sc in center dc of dc group, ch 8, sc between dc groups. Rnd 46: 184 v-st This is the round that I had to "fudge"
one close to the beginning of the row and one a little past the middle. My suggestions on the pattern. Do not even debate changing the directions from the way the pattern is written on round 45 and round 51...just change it -put the dcs in the loop. Ch 3, 8 dc in each chain loop 8 below and dc in each sgl cr around, join with a sl st to the top of beg ch-3. Round 51: easier way and does not change the look of the doily since the stitches above hold the stitches in place. Also: when crocheting on a large project, don't count your progress by rounds since as you get out farther, it takes time to get around the piece. Instead, measure your progress by the use of thread and watch the ball get smaller. I had originally finished the body, maybe a couple of years ago. Then as I read what to do next, I realized it called for 2 bodies, sewn together. I didn't want to do that, as it would make it hard to get dry. Oddly, I just put it up and stopped on it. I took it out tonight and wondered why I just didn't finish it as one layer, the way I wanted it. So, I only had to put the beak and combs on and it was done. Ready for hubby to use as a hot pad on his tv tray! Body is made from dish cloth cotton, but beak & combs from Redheart, so they wouldn't fade. 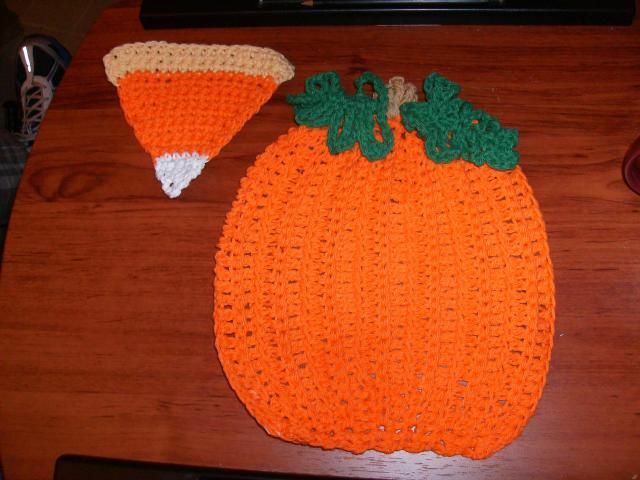 I made the pumpkin from a free pattern on http://www.crochetmemories.com/blog/pumpkin-patch-decorative-potholder/#more-1550 and thought if I could make a candy corn coaster to go with it, it would be cute together. 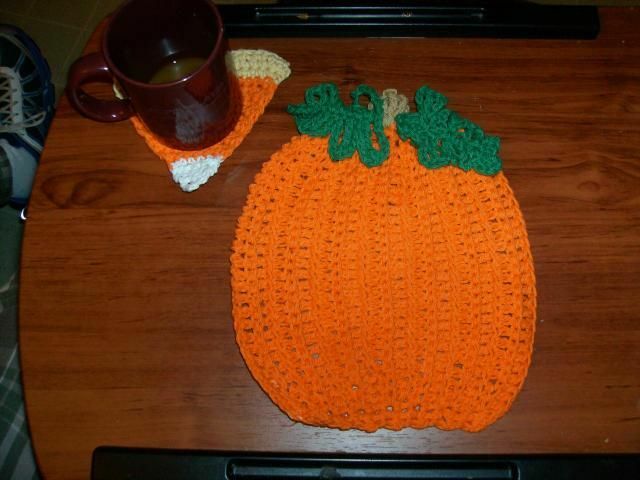 I used dishcloth cotton for both, since they were to soak up spills on hubby's tv tray. I made 20 st and then sc into second st from hook. Sc next row for a firm bottom. Then I just started decreasing at the beginning and end of each row, with crocheting 2 together. The dec at the end of the row was coming off blocky to me, so I did the decrease on the actual last sc and the loop of the turn stitch, and the side remained even and slanted properly - SEE PICS 3 & 4, ravelry link below. When you change colors, it will be on the dec st, at the END of a row. You will pull up the 2 st loops that you are going to decrease with, BUT, pull thru the dec loop with the next color, then your ch 1 and turn, and your next row will all be the same color. When you get to just a few left, crochet them together into a decrease to make the point, cut the yarn and pull it thru the loop. Hide ends. I started and finished my small crinoline girl April 28, 2010. She was supposed to be from size 70thread and a 14 hook to go on a handkerchief, but you know that don't sound like me! Same old #7hook and #10 thread (At Lydia Aqua & White)! I think I learned a lot making her, there were a lot of little fiddly things to do, and ends to bury and things to situate. She came out about 5x6". 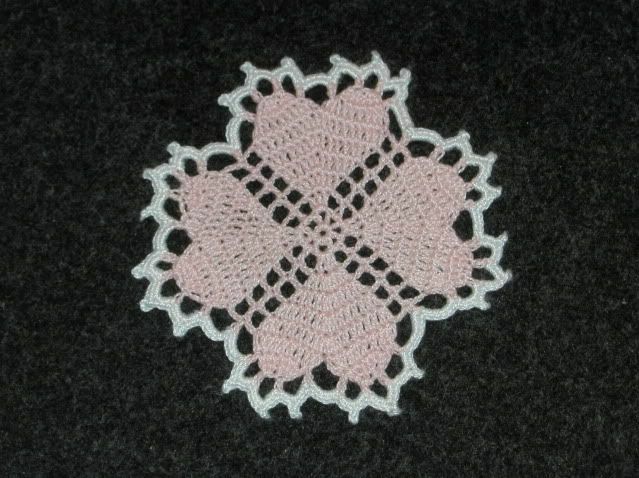 The pattern can easily be found on ebay in the old book Crinoline Lady in Crochet. BUT, be careful to get the original that has writting toward the top of the cover where it says either: 1949 Coat’s & Clark’s (or Spool Cotton Co) Book No 262. If there is no small print at the top of the front cover, then it could be a repro from Yesterdaze, which cost more than the vintage copies AND THEY LEAVE OUT A FEW PATTERNS. That was just maddening to find out I paid more and got less patterns than if I'd just bought an old copy on ebay! I also bought Sunbonnet Lil from them, and find they left out patterns from it too, so just try to get an original from ebay, as the repro's are incomplete. I made 6 petals in my flowers by doing the ch 1, sl st, ch 1 until there were 6. I made 3 extra flowers for the top edges of the skirt and the hat, and I made 3 extra so I could put one of the top of each side of the skirt, and on the hat. The first thing I did was the hat, and I noticed mine was too flat. When I did the white, there was the end thread, which I covered by crocheting over it with the pink for the brim. I saw a little of the end sticking out, and pulled it, and my hat raised into a nice dome, so dont cut that string until you are sure the hat is not flat! I did a few things in a way that were easier for me. Like I didnt put the hat on until AFTER the girl was done. It just seemed to heavy clunking around. So, I took the white hat edging starting and finishing threads and put them thru the dress and tied them in a bow, like anyone would tie their hat under their chin. Since I did not start by attaching bodice to hat, instead I: ch 6, 4dc into 4th ch from hook. Skp 1 ch. 5dc in last st. Then rnd 2. I wanted hands, so I used peach and did 3sc, then 3ch and turned, making 2 dc that went into a cluster for the hand tip. I noticed the beautiful heart shapes on the bottom of the dress, and didnt want anything to interfere with their shape, so left off the ending ruffle. I made the basket, then worked the hand, completing the cluster around the basket. BUT, I wish I had been smart enough to do the flowers before putting it on the hand, they were a bear to get on after it was already attached. I used small wired flowers from the wedding section at Hobby Lobby and wired them on. I used Hobby Lobby Brand "Baby Bee Sweet Delight" in color Snuggle Ombre, with a USA size #F hook. I made some simple changes to the pattern/wording and the designer has incorporated those into her pattern download. The pattern goes extremely fast, highly recommend! 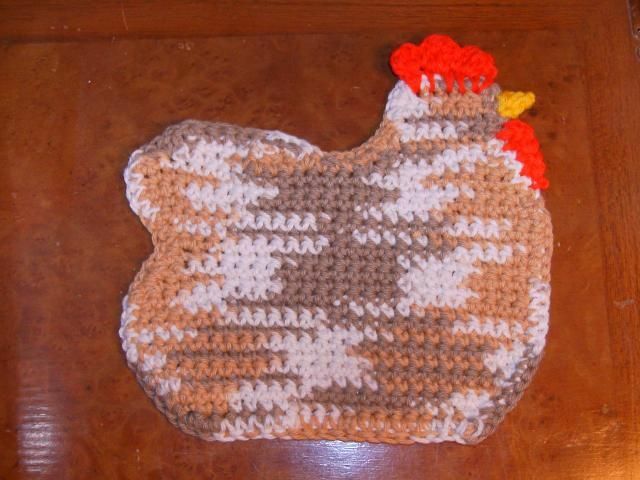 This is a vintage pattern and a little pondering was needed to have it come out correctly. I used a #7 steel hook and At Lydia's #10 thread in white and Golden Yellow. Ok, here's my Autumn Reflections, looking nothing like autumn! I took 2 pics, because I couldn't make up my mind which look I liked better. TRCL: YO 3x and do 2 pull thrus of last tr of the group, then YO 2ce & insert hook in first tr of next shell, and do 2 pull thrus. 3 YO left on hook, pull thru all 3. The only other things you had to keep in mind was to sl st to the place the new rnd started, and that the first tr was always ch 4 + if there were 2 ch between triples, then the first tr would be 4+2ch. Well, it took me 1 hour and 20 minutes to hide all the ends from the heart humps that had to all be worked separately - and that's a LOT of time spent burying ends for a 4.5" doily! I used a pale pink that was a DMC Traditions thread (not cebelia) that used to be found at Walmart, and changed to a white for the final round. There are so many ends because you have to finish each heart bump top separately. It was very sweet when done, though. jimsyldesign-5 pages of dishcloth patterns!